Finally… finally I get to wake up at 2am and go to experience an entire day of bread making. Sorry the conversations in the end are in Italian. I’ve been wanting to do it forever but for some reason I’ve been delaying it. In the small village where I was born, in the north-east of Italy, there is a great bakery, or panificio. The owner and head-baker (if such title exists) is Roberto. Bread is to me just a part of life, family, maybe existence! Bread is never missing on an Italian table, and was certainly never ever missing in my family’s table. I don’t think my dad is capable of functioning without bread at every meal. And really… bread is just delicious! Italy, as other countries, has developed a long lasting appreciation for this food, and as a consequence has devolved years and passion into developing (dare I say “designing”? yes I do) hundreds of shapes and recipes. An array of wonders of textures and flavours available in any bakery around the country. Roberto’s panificio, is no exception. But to me, there’s really one type of bread that stands out. There is one type of bread that is particularly meaningful to me: the “pane con lo zucchero“, or, simply, bread with sugar. This bread does make a small appearance in the video, maybe to signify the small appearance it makes in the entire production of the day. Only about 10 are made every day. And I have no idea what doesn’t everybody in the village love them and buys them everyday! Every time I go back to visit my family, buying a pane con lo zucchero at Roberto’s panificio is one of the first things I do. It just gives me such joy! It’s for me the icon of my childhood, and the pin around which revolve many happy memories of me rollerskating under the portico and drawing with chalks on the pavement. Hi I came across your video in youtube because of the picture of the bread/bun. I have been searching for the name of that type of bread/bun. Would you be kind enough to let me know? Hi Sylvien! do you mean the bread that is in the cover image of my post? the one with sugar on top? or the bread that is in the thumbnail of my youtube video? 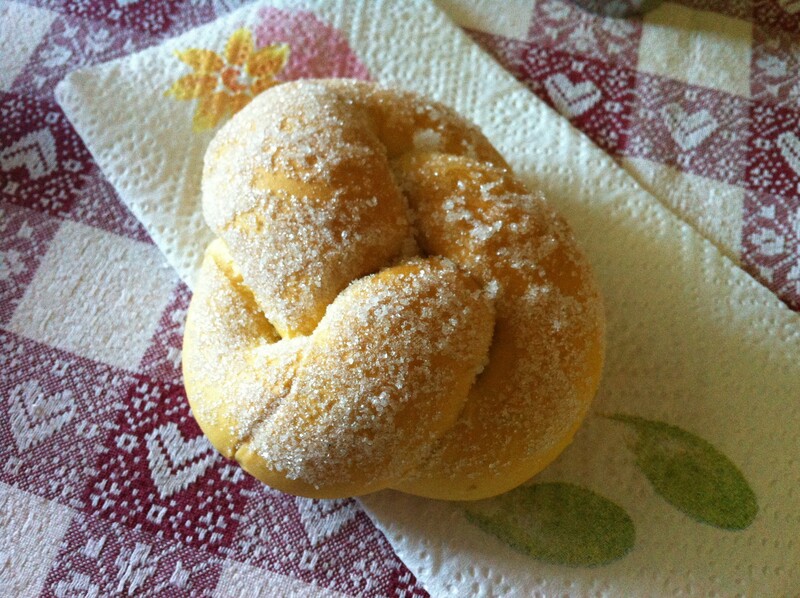 the first, well I don’t know if it has a proper name… in my village (and in the bakery where I’ve always bought it) it’s called simply “pane con lo zucccero” (translated: bread with sugar). The one in the youtube thumbnail is called “mantovana” or “spiga”. the spiga is longer and has two or three oblique cuts and the mantovana, shorter, has one vertical cut only. But please consider, that in that picture, the bread on the right is the spiga or mantovana, the one on the left is… nothing, it’s a mistake… it’s how a mantovana would look like with no cut. hope this helps!